In a not-so-surprising move, NHL Commissioner Gary Bettman has gone back on his word. He is reportedly asking MGM to take Las Vegas Golden Knights games off the boards at local casinos. This creates an unnecessary situation, especially when you hear his motives behind it. Whether or not Bettman’s request makes any headway, there are still legal betting online options for the Knights via licensed offshore sportsbooks. First things first—backstory. The NHL made headlines when they announced they were bringing a franchise to Sin City, making them the first league to do so. The Las Vegas Golden Knights are officially joining the league this season, and local fans are excited to begin wagering on their home team. 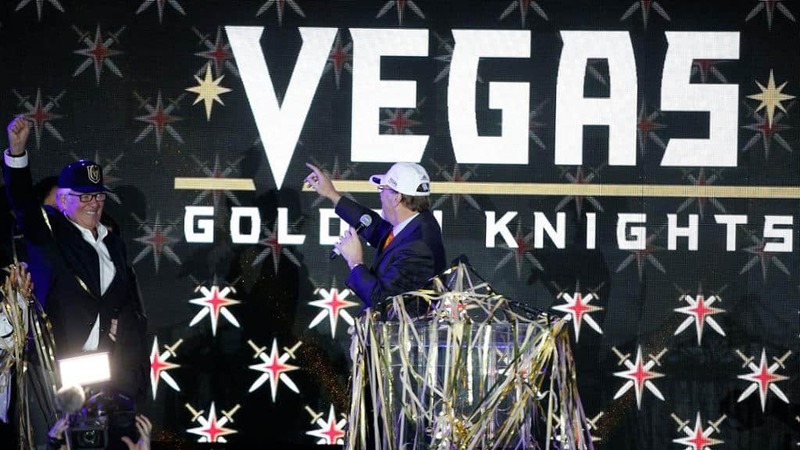 The Golden Knights join the NFL’s Raiders, who are in the process of relocating to Las Vegas. This move showcased the NHL’s stance on sports betting and how it could be shifting, however Bettman’s latest move appears to be a 180-degree turn. When the NHL made their announcement, it was established that they had 30 days before the first game to request Nevada gaming regulators to prohibit betting lines on Knights games. The league stated they would not do so, and they did not. It was also established that the Knights could enter into contracts with sportsbooks and casinos according to their policy. Online sportsbooks offering legal online betting should then be allowed to offer lines on the Knights, regardless of Bettman’s interactions or relationships with casino owners. Nevada is one of the few states exempt from the Professional and Amateur Sports Protection Act (PASPA), one of 3 major US federal gambling laws. According to reports, Bettman’s plan is to ask MGM Chairman Jim Murren to strike home games from nearby casinos and sportsbooks. This includes the Monte Carlo and New York, New York, both adjacent to the Knights arena. Bettman’s rationalization for such an ask? He wants to foster a family-friendly environment. The Knights’ owner intimated that home games would be taken off the boards, but so far there has been no official action. If Bettman is so considered with a family-friendly environment, why bring a franchise to the gambling capital of the nation? Hockey also allows fighting, which is arguably worse than sports betting options. This leads some to believe that Bettman’s intentions are not as they seem, but regardless, this move only hinders the process of achieving widespread sports betting legalization. The fact that the NHL and NFL are bringing franchises to Las Vegas is significant, especially given the fact that they are more against sports betting than the NBA and MLB. For the NHL to try and pull something like this shows they are not fully ready to embrace legitimate sports gambling. If New Jersey wins their case with the Supreme Court, they won’t have a choice. MGM will likely not go for this, since there is too much money at stake. Mobile betting will be offered through the local sportsbooks anyway, and the NHL cannot do anything about that. If the MGM does limit sports betting options with the Knights, it will set a negative precedent that will stifle the growing market.